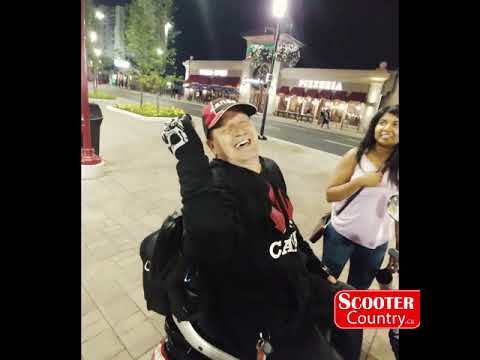 We ran into Mike at Clifton Hill, in Niagara Falls, ON, who showed off his customized Raptor Scooter. We loved his additions with a new paint job, a sound system and even a BAT SIGNAL! The Raptor is the fastest and also one of our most popular models we offer at Scooter Country Canada, and it's easy to see why. At a top speed of 22.5 km/h, The Raptor doesn’t just drive, it flys! I spoke to Richard and he was very helpful. He had a good knowledge of the different scooters and really took the time to explain the different features of each machine. I will certainly recommend Scooter Country to my friends. Richard I hope Scooter Country knows what a asset they have in you. You are the best. Just had the pleasure to talk to Richard. Very helpful and knew what I was looking for and helped me in fine fashion. Thanks again Richard, you are the best and a very good promoter for the business. I wish I have one like this,I think this is so convinient to use for the person like me ,who has aknee problem,,to enjoy life more and better. the guys at the store are friendly and know they scooters .keep up the good work . if I have a question about my scooter i go in or call them to get the right answer .